Hopes of a Pioneer Bowl rematch in the state football semifinals between rivals Black Hills and Tumwater were squashed during the quarterfinals. 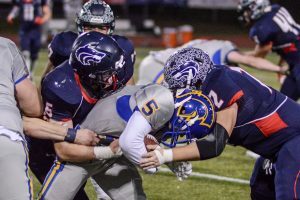 You can blame a stout Fife defense and a Lynden offense which looked razor sharp in the first half for preventing potentially the biggest football game in Thurston County history. 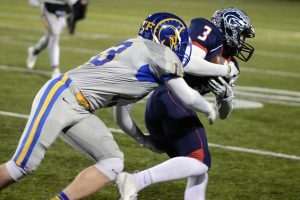 Black Hills saw its perfect season end following a 14-0 loss to visiting Fife in the Class 2A state quarterfinals, while Tumwater suffered a season-ending 28-27 defeat to fellow state powerhouse Lynden in the second round. The Wolves finished their season with a program-best 11-1 record. The Thunderbirds finished 10-2, marking the 21st season Tumwater has registered double-digit wins. 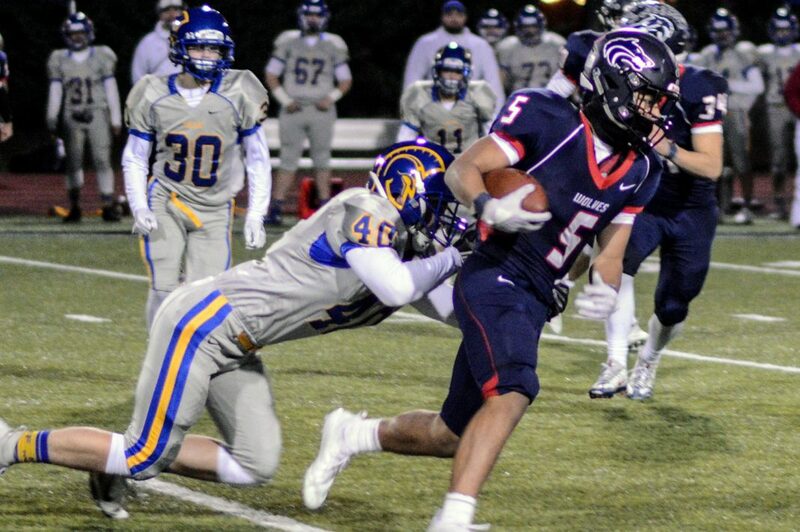 Coming off its first state playoff victory in school history – a 48-8 thumping of Burlington-Edison in the first round – Black Hills was unable to get its high-powered offense going against a much-larger Fife (11-1) defense. For 3.5 quarters, both defenses shined, allowing neither offense to even sniff the red zone. 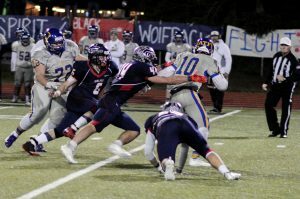 The second-seeded Wolves pinned the Trojans on their own 1 yard line midway through the fourth quarter following a gorgeous punt by junior Nic Bovencamp that rolled out of bounds a foot before entering into the end zone. Fife, however, countered with a seven-play, 99-yard scoring drive, which ended on Gannon Ginnis’ 55-yard touchdown pass to Ethan Policar to produce the game’s first point. The Wolves threw an interception on the first play of the ensuing possession. Four plays later Ginnis came up with a 23-yard TD run, all but sealing Black Hills’ fate. Tumwater wasn’t without heartbreak either in its quarterfinal game against Lynden in Bellingham. The No. 3 Lions (11-0) scored off a pair of Tumwater turnovers in the first quarter to jump out to a quick 14-0 lead over the No. 6 T-Birds. Sophomore quarterback Cody Whalen threw a 5-yard touchdown to Austin Terry early in the second quarter to get cut the deficit in half for Tumwater. The T-Birds later added an 8-yard touchdown run from Turner Allen as they trailed 28-14 at the intermission. Senior Dylan Loftis, who finished with 148 yards on 19 carries, scored twice in the second half, both coming on 2-yard scampers. Loftis’ second TD inched Tumwater within a point at 28-27. However, the T-Birds were unable to find the equalizer after their PAT attempt was blocked. Tumwater’s kicking woes would not end there, however. After a late defensive stop, the T-Birds marched down the field before lining up for a potential game-winning 22-yard field goal with 16 seconds to play. The kick failed, going wide left, ending Tumwater’s season. Since Tumwater was reclassified as a 2A school in 2006 the T-Birds and Lions have met six times in the state playoffs with Lynden holding a 4-2 advantage in the series. The Lions defeated Tumwater (20-10) in the semifinals in 2006 before winning the state championship. Lynden also knocked off the T-Birds in the state title game in 2012 (41-7) and 2013 (38-28). Tumwater won 21-10 in the first round during its state title run in 2010 and 23-21 in the first round last season. As expected both Black Hills and Tumwater placed several players on the all-2A Evergreen Conference team. Senior Taylor Simmons, the Wolves’ leading rusher this season with more than 1,000 yards, was named the conference’s most valuable player. Black Hills also had the conference’s offensive MVP in senior Ethan Loveless and took home honors as the conference’s coaching staff of the year. Tumwater’s Jacob Schuster, a 6-foot-2, 300-pound sophomore defensive tackle, was the selected as the conference’s defensive MVP. Black Hills also had first-team all-conference picks in Tate Elliott (offensive line), Devin Treptow (offensive line), Alex Nagy (wide receiver), Julian Kennedy (defensive line), Jordan Claridge (linebacker), Zach Loveless (linebacker), Lucas Johnson (defensive back) and Bovencamp (punter). Tumwater’s first team honorees included Villami Hofoka (offensive line), Caden Hicks (offensive line), Loftis (running back), Thomas Drayton (tight end), Reid Little (kicker) Ty Gilliland (punter), Scott Duboiski (defensive line), Mason Burbidge (linebacker), Jack Prentice (linebacker) and Patrick Williams (defensive back). Timberline and Yelm both saw their seasons come to an end in the Class 3A state quarterfinals. The eighth-seeded Blazers (9-3) lost to No. 1 Eastside Catholic, 44-14, while No. 12 Yelm (8-4) fell to No. 4 Bellevue, 37-20. Playing in the state playoffs for the first time since 1987, the Tornados raced out to a 20-0 first quarter lead against the Wolverines, but were unable slow down Bellevue’s ground game. 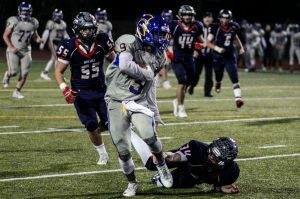 Timberline senior quarterback Hunter Campau was named MVP of the 3A South Sound Conference, while Yelm had the defensive MVP in senior linebacker Derrick Platt and the lineman of the year in senior Jacob Dimond. The Blazers also had first-team picks in defensive lineman Pele Maiava, defensive back Colton Steepy and linebackers Jamin Faalogo and Justin Kuhn. Timberline’s Nick Mullen and his assistants were named the conference’s coaching staff of the year. The Tornados received first-team selections in quarterback Kyle Robinson, wide receiver Kodee Gifford, offensive lineman Bradley McGannon and defensive back Steven Reyes.